After the popularity of the Men on Mats 1 DVD here is the squeal and its a full workout you can do at home and see exactly how it all works. Lots of unique, functional and inspiring ideas for your Fitness Pilates classes and Male PT clients. Section 1 focuses on the anterior and posterior lines of the fascia. Section 2 moves into the lateral facial lines. Section 4 is a flowing routine comprising of all 3 sections. As always, Marvin’s approach to Fitness Pilates is functional, unique and is appropriate for all levels of participant. This DVD is a complete workout packed with ideas for your Fitness Pilates class. 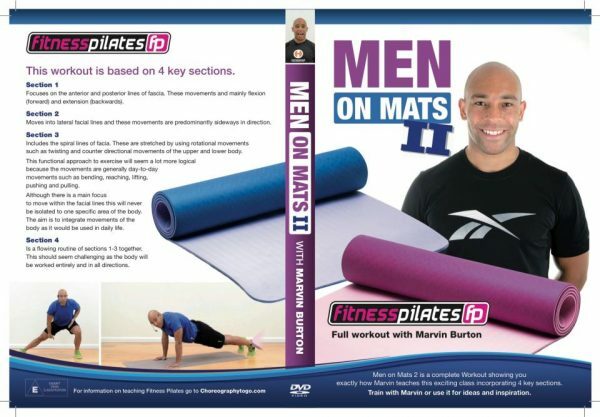 If you LOVED our Men on Mats series then you will love the follow up DVD.